The eight joint research projects, which were selected for transnational funding by means of a virtual common pot approach, started in July 2007. Read more about CORE Organic and the research projects in the leaflet below (PDF). A more elaborate description of each project, results, perspectives and impact can be found on these webpages. Read about the CORE Organic research projects below (pdf leaflets). To obtain a sufficient yield of vegetable crops, fertilization with nitrogen, phosphorus and potassium is necessary. The use of animal waste and by-products as a sustainable resource for crop fertilization and soil improvement, preferably recycling on-site, is a core component in organic agriculture. Sources of mineral phosphorus are limited and it will become a rare available nutrient in the near future. An alternative, renewable source that will become increasingly vital in the future is animal waste such as manure applied as crop fertilizers and soil amendments to optimize soil structure and microbial ecological balance. The PathOrganic project surveyed the occurrence of human pathogenic bacteria in manure and vegetable production systems, and examined transmission pathways from manure to soil and organic plant crops. The project has provided a guideline to confront microbial food safety risks in organic vegetable production. The guideline "Manure for vegetables - recommendations for farmers" can be found below. The risk of bacterial infection to humans from eating vegetables is not known and it is also not yet possible to say whether an organically produced vegetable represents a bigger infection risk than a conventional. A good hygiene practice in the handling of fruits and vegetables from harvest to the consumer is therefore important to reduce survival and possible growth of infectious agents, which may be introduced on the field. The use of manures and slurries as fertilizers can be an important pathway of infestation of vegetables with bacterial pathogens. However, human pathogenic bacteria may already be present in the soil, or may be introduced from contaminated water or other sources. Therefore, it is important to identify potential pathways of infestation and to define critical control points to lower food safety risks due to human pathogens present in or on vegetables. Major objectives of the PathOrganic project were to survey the incidence of bacterial pathogen infestation of leafy vegetables collected on the field in five European countries, to investigate pathways of pathogen contamination, to examine in detail which factors contribute to contamination, and finally, to provide recommendations for safe vegetable production procedures. Use of manures and slurries as fertilizers can be an important pathway of infestation of vegetables with bacterial pathogens. However, the pathogens might already be present in the soil, be introduced from contaminated water or other sources. Most of the manures tested contained human pathogenic bacteria. 80% of the total manure/slurry samples tested positive for at least one pathogen or EHEC virulence gene. Screenings of organic fertilizers from a range of vegetable farms represented the basis for successive screenings of vegetables grown on farms where a potential safety hazard was indicated. Analyses were concentrated on leafy vegetables such as lettuce and spinach, because here fertilization practices were most likely to cause pathogen transfer to the plants, and additionally included carrot samples. An unexpected high number of vegetables were colonized by bacterial pathogens. Except for one field (carrot), samples that tested positive for one or several pathogens or E.coli virulence genes were collected from all farms. Salmonella sp. 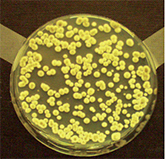 and Staphylococcus aureus were the pathogens most often retrieved. 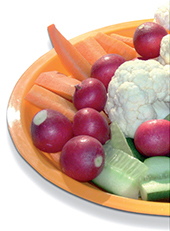 However, since enrichment of the bacteria was used prior to PCR-based analysis, the actual numbers of pathogens present in or on the vegetables are unknown. A positive DNA result does not necessarily mean that the bacteria are alive, and bacterial cell numbers may be well below the infectious dose. Therefore, the screening results cannot be used to conclude on any potential risk to human health. Still, the results stress the need for stringent post-harvest handling and processing procedures in terms of restricting survival and proliferation of pathogens possibly introduced on the field. The contamination pathway along the vegetable production chain appears to be very complex. DNA fingerprinting showed that only a few E. coli bacteria from lettuce had fingerprints identical to the E. coli originating from the animal slurry applied. This suggests that the animal slurry fertilisation was not the sole source of faecal contamination but that wildlife plays a role in the contamination with E. coli, either directly or indirectly through contaminated water. Following manure application to the soil, there will be a decline in the numbers of pathogens, but the specific decline rate depends on physical and chemical conditions. 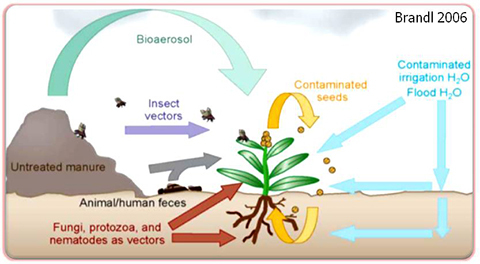 The initial pathogen load as well as the time of manure application are important factors for the risk of crops being colonized by pathogens. The interactions between crops and pathogens present in manure-amended soil and the fate of pathogens in/on crops during the growth period are much harder to estimate under field conditions than in greenhouse experiments. A key factor here is whether the pathogens experience conditions which allow that they may proliferate. More details can be found in the final report of the project and in the publications that are available through Organic Eprint. Please use the links below. Browse the PathOrganic publications in the online open-access research archive, Organic Eprints. Get the PathOrganic information leatlet (pdf). produce contaminated with enteric pathogens. PathOrganic has defined guidelines to confront food safety risks in organic vegetable production.